In honor of what would have been her mother’s 100th birthday this past September, Rebecca and Woody Fridae and their extended family have donated a lovely green book cart to the Winters Friends of the Library to use at book sales and events. 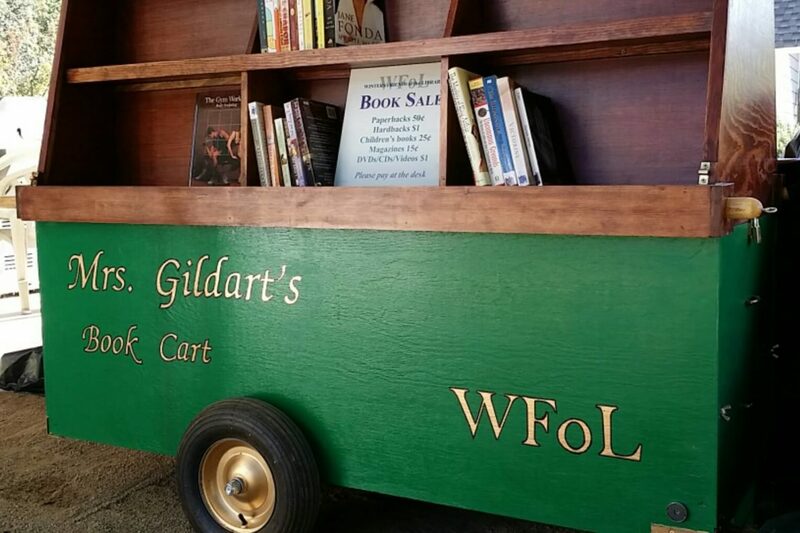 Painted green and hand-lettered with the words, “Mrs’ Gildart’s book cart, Woody designed and built the push-cart, which rolls on two wheels and can carry dozens of books. Marcella Gildart was one of the founding members of WFoL. Community members were upset, when in 1976, our local library was closed due to funding cuts after proposition 13 passed. They decided to start a friends group to raise money through book sales and bake sales to reopen the library, and then continue supporting the library with fundraisers to buy books and provide programs for children. The original group consisted of Mrs. Gildart, Vera Herala, Dagney Huillade, Liz Coman, and Karla Knabke. We appreciate the dedication of the founding members who have inspired new generations of library lovers and readers. Our current Winters Friends of the Library programs and membership have blossomed. Thank you to the Fridae Family for adding to WFoL’s ability to promote literacy and make books available to our community while raising funds and awareness to support our Winters Community Library services. The book cart will have its inaugural run at the last Winters Fourth Friday Feast for 2016, and will be positioned downtown for all to come and browse its shelves. On November 14, Mrs. Gildat’s Cart will grace the lobby of our Winters Community Library for the Winters Friends of the Library Annual Membership gathering.